"Molasses, the thick and sticky byproduct of sugar production. You can use any kind of molasses, from light to blackstrap. You could even use pomegranate molasses or some more exotic breed if you’d like. Brits can substitute treacle (dark or light). Go crazy with this smoky-flavored and somewhat bitter ingredient. " Quite some time ago I purchased a bottle of Pomegranate Molasses. I was perusing the aisles of Big John’s PFI and stumbled across several types of molasses! How fun! The pomegranate jumped out at me, because several months prior R had used this in a cocktail she had created for our Moroccan Dinner Party. I’d been meaning to recreate that cocktail for quite some time. Well, today just happens to be the perfect day – not only is it warm and sunny (especially on the deck) but it’s Friday! And a Sugar High Friday, at that! I had to make some changes to the original recipe since I didn’t exactly have everything on hand and because I wanted to adjust it slightly to my taste. It would be fun to continue tweaking (but I really need to mow the lawn…) but it’s awfully good as is! Thanks so much, R! Put first 5 ingredients in shaker glass. Muddle until lime juice and mint are thoroughly mixed and drink is chilled. Divide between two martini glasses. Top with seltzer water. Add slice of lime for garnish. Put first 6 ingredients in bar glass and muddle until mint and lime have released juices and mixture is thoroughly chilled. Pour into chilled martini glass, top with a little club soda (to taste), then garnish with mint. YUM!! That sounds great! My favorite drink in Seattle is at the Jitterbug in Wallingford. 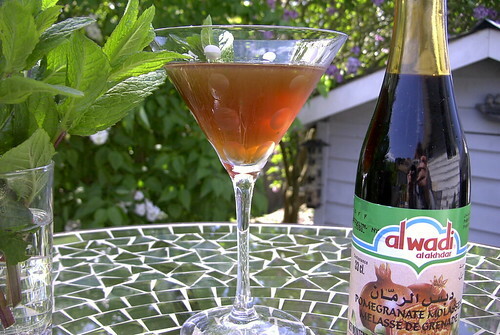 It\’s basically the same drink except with vodka instead of rum and the rim is coated with sumac sugar. It\’s sooo good!